From a small yet inspired church in northern Colorado comes a strikingly fresh album of ancient hymn texts set to new music. 12. Alas and Did My Savior Bleed? "Thine all the merits, mine the great reward; Thine the sharp thorns and mine the golden crown; mine the life won and Thine the life laid down"
Samuel Stone wrote these words in 1866 as a rise of skepticism threatened to destroy many of the church's foundational doctrines including the Apostles Creed. In response to that, Samuel Stone wrote Lyra Fidelium - Twelve Hymns on the Twelve Articles of the Apostles Creed. "Thine All the Merits" was based on the 10th article - "the forgiveness of sins". Why the short church history lesson? First, knowing the context of the hymns we sing always brings new life to their words, deepening our appreciation for them. Second, we often forget that we are inextricably connected to our forefathers and mothers that have carried the faith from their generation to ours. It is good to remember the labor of the faithful that have gone before us - to be encouraged by their faith in the midst of struggle, and strengthened by the words that flowed from hearts steeped in the truth of scripture. It is in this spirit that we create new compositions to illuminate some of the great hymns that have been long forgotten. 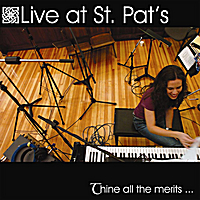 This album is a collection of some of the new compositions that have been written & arranged by Saint Patrick musicians over the past 3 years. It represents the community in which we worship. It's our prayer that these songs will be relevant to you and your community as well.